The day was absolutely perfect for getting out and giving my new crampons a test run. The kids were to school, and I was on the trail by about 8:30 am. Conditions were just about perfect. The temperature was about 40 degrees F, a light wind was blowing, and the sun was shining beautifully. Trail conditions were just what I wanted . 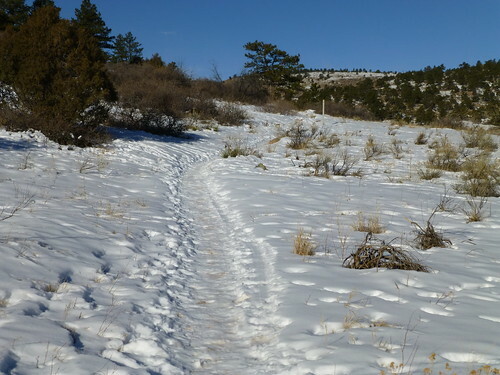 I started off on the Nighthawk Trail, and immediately hit snow-packed and icy trails. 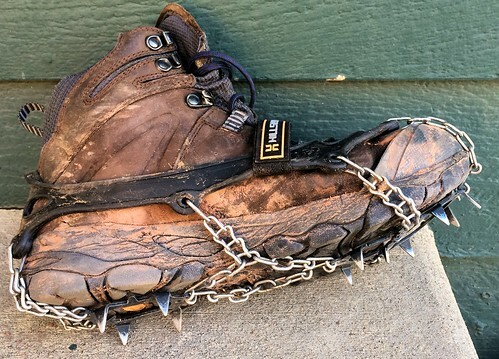 If you’ve never used crampons before, it takes a little getting used to, and a bit of trust in the manufacturer. They are really easy to use in snow pack, but once you hit boulders and exposed rocks, you have to trust that the spikes won’t bend. These new Hillsound Crampons worked like a charm. 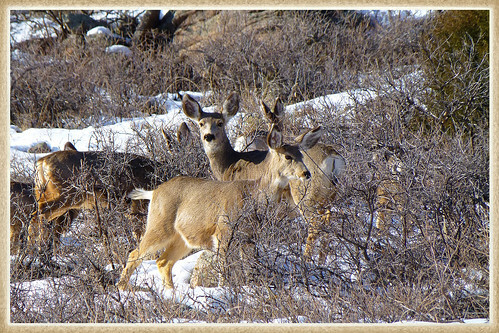 Within about a mile, I looked up and saw a beautiful herd of deer grazing above me. They didn’t give me too much heed, and I pounded along my way. 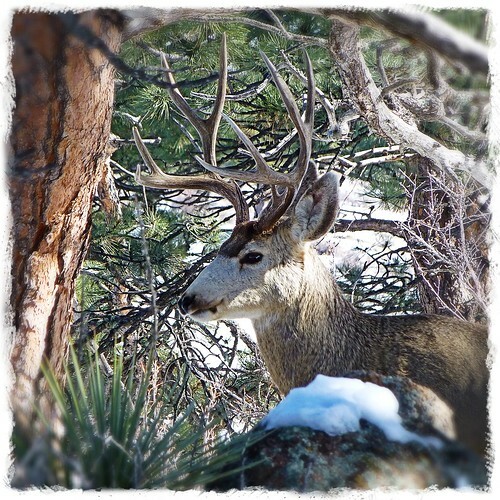 I knew I would run into some wildlife, but I had no idea that in a few hours, I would be standing in the middle of another herd, with a beautiful buck looking right at me. Conditions continued to change, and eventually, I was facing some serious winds, and ever deepening and drifting snow. It became easy to lose the trail. 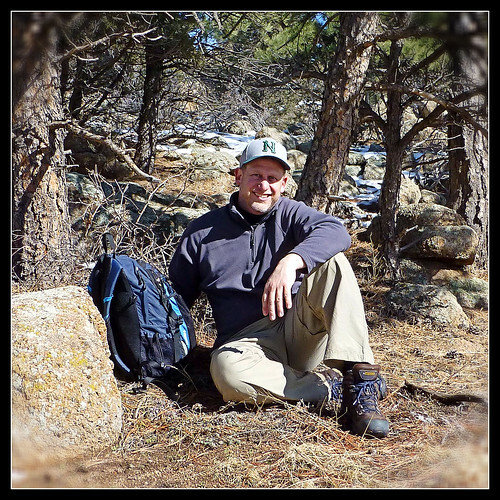 I was very happy that I had my Delorme InReach SE, the Boulder County Trail App on my iPhone, and a compass. Each time the trail vanished, I was able to route myself to meet up with another section of the trail. 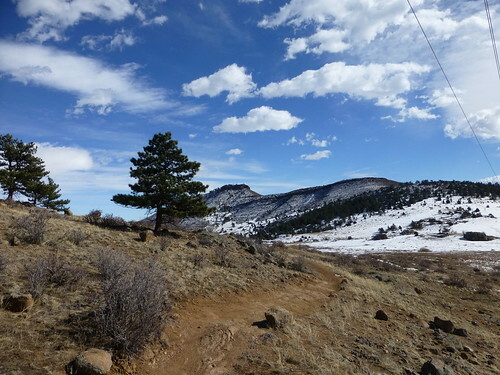 The Nighthawk Trail runs for about 4.7 miles, gaining about 1,180 feet. It runs into a segment of the Nelson Loop that I followed to pick up the Bitterbrush Trail. While the wind was howling, I was thoroughly enjoying another day of total solitude in the mountains. Once on the Nelson Loop Trail, I was surprised to see an old cabin. It was the Nelson House, built around 1918. The Park Service has sealed up the cabin, which was too bad for me. A nice sheltered place would have been great for lunch with the wind howling like it was! I trudged through some deep snow to get up close to the cabin and read the nearby plaque. 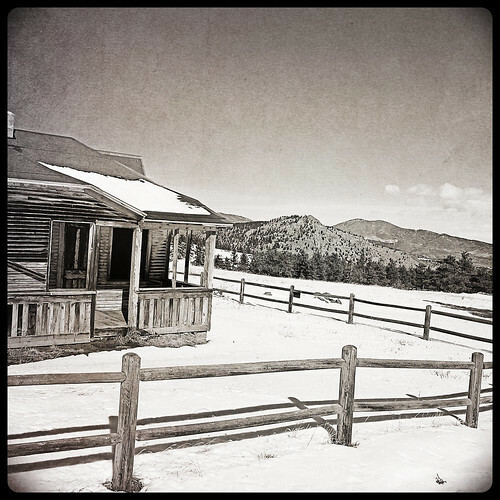 I took a few pictures, and wished that the cabin hadn’t been sealed up by the park service. With a strom front threatening to begin moving in, and the wind picking up even more, I headed toward the Bitterbrush Trail. Within about mile, I heard that sound of a young deer, and I realized I was right in the middle of a herd of deer. Not near a herd, I was literally surrounded. It must have been about thirty members, and the buck was simple looking at me. He was no more than about fifteen feet away, and he didn’t seem too terribly concerned that I was so close. I was amazed that he let me take a number of pictures, while he kept a weary eye on me. I thanked him, and soon was beginning to leave the snowy conditions behind. With only a few miles left on the hike, I hit an area that was almost completely dry. The crampons came off and I decided it was time to set up the gorilla tripod and try to get a pic of myself. My mom has always been insistent that I try to get some photos of myself on some of this wonderful hikes that I take. I’m getting a little bit better at the “Selfies”! The end of the trail was a total mess. I was very happy in the areas that consisted of small boulders and exposed rock, as the rest of the trail was a absolutely, sloppy muddy mess. There were a number of places where the melting snow turned the trail into a small stream. 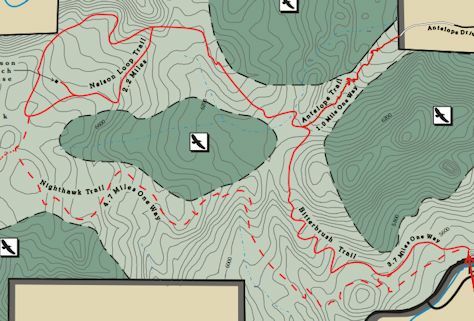 Part of these trails will likely be closed this weekend, just to keep the damage to a minimum. By 2:30 pm, I was back in my truck, and heading for home. It was another awesome, beautiful day in the Rocky Mountains! Click on any of the pictures, or right HERE to see my Flickr photo set from this beautiful day of hiking. ** As a serious solo trekker, I always have base crew who know my itinerary, and I carry a Delorme InReach SE. The InReach enables me to SOS the IERCC (formally known as the International Emergency Response Coordination Center), while my base crew is able to track my movements, and can coordinate a rescue should I become incapacitated. Hello website owner, do you allow guest posting ? Please let me know, i’m interested .